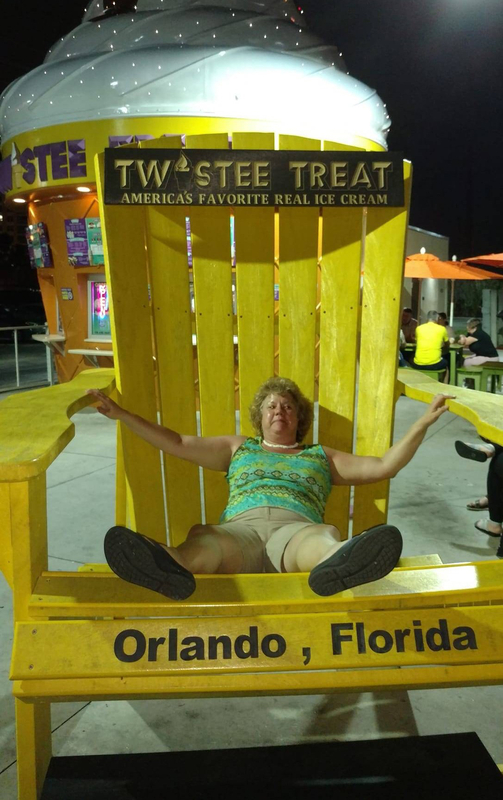 Playing on a big chair while waiting for vanilla-chocolate twist cone with chocolate sprinkles in Orlando, February 2019. February 25, 2019: I turn 54 today at 9:50 p.m. I’m cool with it. It’s better than the alternative, they say. I’ve had a lot of major changes in the past nine or so months that have made me appreciate how time keeps on tickin’, tickin’ into the future. Changes, huge changes are making me take stock of where I am and what I am doing. What do I want to do? What do I really need to do? I keep coming back to “Choose Joy over Drudgery” whenever possible. If it’s fun or going to bring good health and happiness– and I have a choice–why not listen to my ten-year-old self and choose what she would choose? I’m tired of being “too serious” and “on.” Now, after major life changes, I want to chill out a little and be as carefree as a fifth-grader! One of the biggest changes in my life recently was my husband’s retirement from 31 years on the Middletown Police Department this past summer. It’s really been a couple’s career or lifestyle. Both of us experiencing over three decades of the ups and downs of a noble, exciting, gratifying, yet- sometimes-thankless, public-service career. We’ve dealt with changing schedules, unforeseen emergencies—in short, just a little bit of stress. It has often ramped up anxiety in me, forcing me to my knees. Not a bad thing to pray the fear away. Still, over the years, I’ve watched in horror, the change in some of the public sentiment regarding police. When Sean first started in the mid-80s, police were highly respected and revered. In recent times, they’ve been hated and even hunted down, killed in the line of duty! I am beyond grateful and relieved he/we made it to retirement. Sean retired from 31 years of service on the Middletown Police Department in August 2018. No more second phone going off at all hours. No more dangerous SWAT calls (although I know he misses those kinds of adenine scenes the most!) He took a new, basically stress-less job right away as a resource officer at an elementary school. Now instead of managing 83 cops in the patrol division, he high-fives the pre-K to 4th graders as they come in and out of the building. He makes sure visitors are signed-in and accounted for when they leave. He is currently unarmed (which nowadays I wish he was), but he says he finds it less stressful than carrying. I will keep praying for his safety (and that of staff and students there). It is great to see him come home from work smiling, sharing highlights of his day—something funny or cute a kid said or did. Now he gets 13 weeks off including all holidays, weekends and summers. Not a bad gig! Another huge life-altering thing is that in the past nine months, I’ve gone to seven funerals. Some were relatives of friends, others distant relations, but some were oh, so very close to home and heart. My mother’s husband Paul died in early August, followed by my sweet Aunt Wanda, who died after a short illness just two weeks later. And then, flooring me to the core, my Dad died very unexpectedly two days before Thanksgiving. I found him in his easy-chair. His passing was and still is so surreal to me. We’ve had such a long, bitter/sweet journey, but he died with so much dignity. I’m doing better with my grief. I just didn’t expect it to hit so hard. I’ve been coming up from it by journaling, taking care to just “be” in moment. There’s lots more to unspool. On the upside, my siblings and I have been banded together like never before since my Dad’s passing. That is no small thing, and I am so incredibly in awe and eternally grateful. So, as I start my New Year (as my Dad would explain that’s what one’s birthday was, a personal New Year), I am in a fresh, contemplative, if not an odd place. I’m not really sure which way I am going, or what’s next. So, maybe it is a good time to just listen to my inner child and follow her lead for a while. What are some of the ways you play? Have fun?